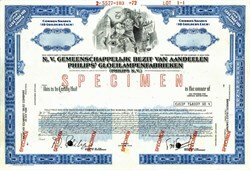 Beautifully engraved specimen stock certificate from the Philips N.V. Philips Gloeilampenfabriken printed in 1972. This historic document was printed by the American Banknote Company and has an ornate border around it with a vignette of a man with the company logo, misical notes, an eye, and lab equipment. This item has the printed signatures of the Company�s Chairman ( Philips ) and a Member of the Board of Management and is over 43 years old. Royal Philips Electronics of the Netherlands is one of the world�s biggest electronics companies and Europe�s largest, with sales of EUR 32.3 billion in 2001. It is a global leader in color television sets, lighting, electric shavers, medical diagnostic imaging and patient monitoring, and one-chip TV products. Its 186,090 employees in more than 60 countries are active in the areas of lighting, consumer electronics, domestic appliances, components, semiconductors, and medical systems. Philips is quoted on the NYSE (symbol: PHG), London, Frankfurt, Amsterdam and other stock exchanges. Royal Philips Electronics is ninth on Fortune's list of global top 30 electronics corporations. We are active in about 60 businesses, varying from consumer electronics to domestic appliances, and from security systems to semiconductors. They are a world leader in digital technologies for television and displays, wireless communications, speech recognition, video compression, storage and optical products as well as the underlying semiconductor technology that makes these breakthroughs possible. They have world class solutions in lighting, medical systems (particularly scanning and other diagnostic systems) and personal and domestic appliances where our investments in design and new materials are critical to success. Translated into figures, they produce over 2.4 billion incandescent lamps every year, and some 30 million picture tubes; and each day, their factories turn out more than 50 million integrated circuits. Around 2.5 million heart procedures (scans and interventional procedures) on X-ray equipment are carried out each year using our technology. One in seven television sets worldwide contains a Philips picture tube, and 60 percent of all telephones contain Philips products. Thirty percent of offices around the world are lit by Philips Lighting, which also lights 65 percent of the world's top airports, 55 percent of soccer stadia, and 30 per cent of hospitals. The company initially concentrated on making carbon-filament lamps and by the turn of the century was one of the largest producers in Europe. The foundations for what was to become one of the world's biggest electronics companies were laid in 1891 when Gerard Philips established a company in Eindhoven, the Netherlands, to 'manufacture incandescent lamps and other electrical products'. Developments in new lighting technologies fueled a steady program of expansion, and, in 1914, it established a research laboratory to study physical and chemical phenomena, so as to further stimulate product innovation. Philips' first electric shaver was launched in 1939, at which time the Company employed 45,000 people worldwide and had sales of 152 million guilders. Science and technology underwent tremendous development in the 1940s and 1950s, with Philips Research inventing the rotary heads which led to the development of the Philishave electric shaver, and laying down the basis for later ground-breaking work on transistors and integrated circuits. In the 1960s, this resulted in important discoveries such as CCDs (charge-coupled devices) and LOCOS (local oxidation of silicon). The flow of exciting new products and ideas continued throughout the 1970s: research in lighting contributed to the new PL and SL energy-saving lamps; other key breakthroughs came in the processing, storage and transmission of images, sound and data where Philips Research made key breakthroughs, resulting in the inventions of the LaserVision optical disc, the Compact Disc and optical telecommunication systems. Philips established PolyGram in 1972, and acquired Magnavox (1974) and Signetics (1975) in the United States. Acquisitions in the 1980s included the television business of GTE Sylvania (1981) and the lamps business of Westinghouse (1983). The Compact Disc was launched in 1983, while other landmarks were the production of Philips' 100-millionth TV set in 1984 and 300-millionth Philishave electric shaver in 1995. The 1990s was a decade of significant change for Philips. The company carried out a major restructuring program to return it to a healthy footing. And more recently it has been concentrating on its core activities. Today, Philips is at the leading edge of the digital revolution, introducing world-class products that are helping to improve people's lives as we continue into the new millennium.